UPDATE (8/13/18): Recently I received a tip from a reader that the November 25, 2014 Sawbones segment about my father and my family had disappeared from the internet. Not long ago I sent courteous e-mails to co-hosts Sydnee McElroy MD and her husband Justin McElroy asking what happened, but I never received any reply. 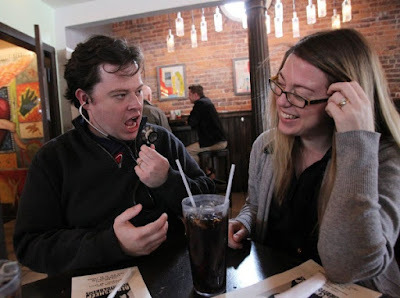 In a half-hour Thanksgiving holiday podcast ostensibly about my father's history of medical misconduct, Sydnee McElroy MD and her husband Justin McElroy of Huntington, WV, spent half the program making fun of the members of my family, alluding to us as "crazy" and "weirdos." Dr. McElroy said she did so to assure listeners -- who reportedly number in the tens of thousands -- that no matter how screwed up their families are, my family's got it worse. 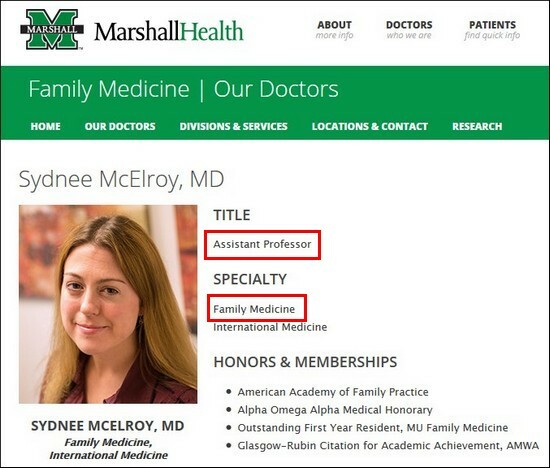 A board-certified physician on faculty at Marshall University who specializes in family medicine, Dr. McElroy admitted during the program that she'd searched for "anything weird" about each of us, presumably with the intention of denigrating us. Further, in response to my questions about factual errors and other problematic information she reported, Dr. McElroy refused to back up her work and indicated that she was under no obligation to provide accurate information to listeners. The weekly humor podcast fea­tures (Justin McElroy and his wife, Sydnee McElroy), a Hunting­ton-based family doctor, dissect­ing medical history uncovering all the odd, weird, wrong, dumb and just gross ways doctors have tried to fix people. Recorded every Thursday here in Huntington and heard weekly around the world on iTunes and Maximum Fun, the quirky medi­cal-based podcast — which has poked fun at everything from bizarre hangover cures to blood­letting — is chalking up between 35,000 and 40,000 downloads per episode. On November 25, they aired a 30-minute podcast called The Heimlich maneuver. The first part of the program was about my father's problematic career and unfounded medical claims -- unquestionably fair game for a program about quack medicine. But halfway through the program, the McElroys changed course and systematically went after the members of my family, including my late mother. Dr. McElroy went through a laundry list of our names, sticking pins in each of us based on what she considers to be our failings, while her husband interjected wisecracks. Per this clip, Dr. McElroy admits it was her idea and explains her purpose for doing so. Sydnee McElroy MD: I'm gonna talk about (Dr. Heimlich) himself first and some of the stuff he's done, but then, I just, I..I got into this topic and I'm gonna have to tell you about (Dr. Heimlich's) family as well because...well, it's just great. And I think this is another good Thanksgiving topic. You know, everybody's crazy families are coming in, you're going to spend a lot of time with all the weirdos you're related to? Well, you got nothing on the Heimlichs. The segment about my family goes on for some time -- too long to upload under Fair Use laws, so I've posted short clips. First, Dr. McElroy goes after my mother, the late Jane Heimlich, because she wrote books about so-called alternative medicine. Throughout her life, she endured harsh emotional and other abuse, first at the hands of her sadistic father, dance studio mogul Arthur Murray, then during five decades of marriage to my father. In her 2010 memoir Out of Step, she left out most of the horrors, but to her credit, mom found the strength to share some of the humiliation and betrayal that my father put her (and the rest of us) through. Next, the McElroys aimed their peashooters at yours truly. I'll get to that in a second. They then started in on my younger sister Janet Heimlich, who authored a book about child abuse and who heads a nonprofit "that seeks to protect children from abuse and neglect enabled by religious, spiritual, and cultural ideologies." The McElroys think Janet deserves to be their piñata because she advocates against circumcision. Next they aim their sights at my older brother Phil Heimlich. Why do they think Phil's a "weirdo" who's worthy of their derision? Because he chose to become a Christian. At the end of the clip, Dr. McElroy says she "couldn't find anything weird" about my other sister, Elisabeth Heimlich. In other words -- and this deserves the bold red highlighter -- Dr. McElroy admitted that she went out of her way to search for what she considered to be negative, denigrating information about each of us. Incidentally, Elisabeth is a talented photographer who took the beautiful portrait of my wife Karen Shulman that's attached to the audio snips. Okay, here's my turn in the barrel. In her efforts to "find anything weird" about me, either Dr. McElroy's a lousy researcher or I've led an unblemished life (ha, ha). The best she could do was to claim that my website is unreliable and written in a "stream of consciousness" style. What Dr. McElroy doesn't say is she almost certainly used information from my "unreliable" website. Briefly, my site, Outmaneuvered: How we busted the Heimlich medical frauds, summarizes how Karen and I unexpectedly uncovered the remarkable unseen history that became the basis for scores of media reports that exposed my father as a dangerous charlatan whose unfounded medical recommendations put the public at risk and who scammed big bucks from naive donors including Jack Nicholson, Ron Howard, Bette Midler, and Muhammad Ali. About halfway down my home page, I included a few paragraphs describing how Phil and Janet had unsuccessfully tried to undermine Karen and me. Like it or not -- and I didn't -- that's a legitimate part of our story. From those paragraphs, Dr. McElroy apparently cherry-picked facts she considered to be negative -- Janet's critiques of circumcision and Phil's religious beliefs -- took them out of context and used them in her attempts to belittle my sis and bro. No, I'm not pleased that Dr. McElroy apparently used information from my site as rocks in her slingshot. If so, her choice to do so speaks for itself. Digging a deeper hole, Huntington's fun couple also claim that I'm a conspiracy nut. That raises an interesting question I can answer. For reasons that remain unclear, in their stompfest on my peeps, the McElroys chose not to mention Karen. Since Dr. McElroy says she was all over my website, she knew that Karen has been my equal partner in researching my father's unusual career. Since they disappeared Karen, it's unclear if the McElroys also think she's a conspiracy nut. I've had the very good fortune to have been married to her since 1988, so I can assure them that Karen doesn't believe in conspiracies. Like me, she thinks much of the misery in the world is caused by types who get their kicks stepping on other people. Along those lines, in the same clip Dr. McElroy chuckles as her husband assures their listeners, "So no matter how awkward your Thanksgiving is, keep in mind that someone out there is having a more awkward Thanksgiving." My family's Thanksgivings aren't awkward. In Spring 2002, my wife Karen and I began researching the career of my father, Dr. Henry J. Heimlich of Cincinnati, famous for the "Heimlich maneuver" choking rescue method. "My father's the great Dr. Lifesaver," Peter says bitterly. "How could he have let this happen?" When he tried to get the facts, he says, his father hung up on him and his mother wouldn't respond to his letters. Since Spring 2003, much of the information we uncovered has been reported by mainstream print and broadcast news outlets in the U.S. and abroad, but there's plenty more I hope to get reported. For example, what was the nature of my father's relationships with at least three doctors who lost their licenses for extreme over-prescribing of narcotics, two of whom did prison time? Since the McElroys put my work under their microscope, turnabout is fair play. First, I think their concept of a comic-edged, educational program about quackery is terrific. And Sawbones is a very clever title. Comedy's in the ear of the beholder, so I'll let others decide if the McElroys deliver the goods in that department. 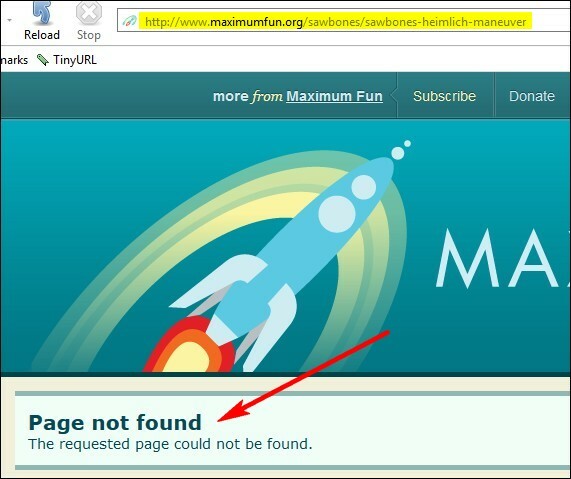 But, based on my experience, the educational part is a fail. Among other reasons, Dr. McElroy wrote me that she doesn't care if the information she provides to listeners is accurate. Sydnee McElory MD: I've read all about this now to try to figure out what is their evidence for which is the best (treatment response for a choking emergency). Obviously, again there's no studies on (back blows or the Heimlich maneuver), like no controlled studies 'cause you can't. You can't force people to choke and then try to save them. So it's all based on our experiences with these things and then theoretically. Dr. McElroy claims to have "read all about it," but apparently she didn't even search for any articles in medical journals via PubMed. If she had, she would have located published studies about choking by my father, Charles Guildner MD, Archer Gordon MD, and others who used both human beings and animals as research models. Dr. McElroy apparently never even looked at my father's entry on Wikipedia. If she had, she would have been aware of Dr. Guildner's study and a widely-cited 2000 choking study by Audun Langhelle which used cadavers as research subjects. I'm no expert but my understanding is that studies using cadavers has been going on for centuries. Based on Dr. McElory's comments, that apparently never even occurred to her. In an attempt to learn more, in a December 2nd e-mail I asked if she'd searched PubMed. At time stamp 25:20 (of the program), you said: (Peter Heimlich) thinks that there's, like, a big conspiracy behind all this, that there was a lot of money changing hands and powerful people and probably stuff that wasn't...I don't know. Would you please direct me to the information on which you based your assertion that I think there's "a big conspiracy behind all this." Also would you please clarify what you meant by "all this"? I'm sorry, but I just simply don't have the time to provide you with all the information you requested. I work full time and I cannot research a show more than once. Our show is a comedy podcast meant to provide entertainment. In other words, she refused to back up her own statements -- about misreporting medical facts and her criticisms of my work -- and she doesn't care whether or not the medical and historical information she shares with listeners is accurate. Given the effort she puts into her podcast, a more accurate title might be Lazybones. I'll wrap this up by confirming that the McElroys got at least one thing right. When it comes to a Norman Rockwell "Happy Thanksgiving" stereotype, we Heimlichs don't fit the bill. Like many if not most families, we've had our share of serious challenges, conflict, and pain. But as the saying goes, you can't choose your family. However, you can choose your doctor. Are you looking for a doctor so indiscreet that she'd share such opinions with tens of thousands of strangers in a podcast? Are you looking for a doctor clueless enough to attempt to publicly humiliate my family and not perceive that in response she might get a dose of her own medicine?